As reported by the Bexhill Observer on Friday, recorded hate crime has risen by a quarter in Sussex over the past year. During the period April 2015 to March 2016, the total number of recorded crimes rose from 1352 in 2014/15 to 1728 in 2015/16, an increase of 28%. This follows another large increase, in the previous year, of 34%. The number of non-crime hate incidents also rose during the same period, from 447 in 2014/15 to 502 in 2015/16 – an increase of 12%. These are shocking figures but, despite the rise, police have said they are encouraged. They say this shows better reporting on the part of the police, and a greater willingness for victims to come forward and get the help they need. It certainly does prove that hate crime should be a top priority for a PCC in Sussex. It follows news from earlier this year that reported a 37% spike in race hate crimes on British railway networks, and news from late last year reporting an 18% rise in hate crimes across England and Wales. As PCC, I intend to put a great deal of focus on tackling this issue in Sussex. While it is encouraging that awareness and police reporting is improving, these figures show there is a worrying problem in our communities. I will make sure we are tackling the root causes of hate crime, as well as the effects. That means working with charities and support networks to build awareness of hate crime, challenge the prejudices that lead to these offences, and support victims in the most effective way possible. I want to be part of a community where everyone, regardless of disability, race, religion or gender identification, feels safe and secure in their homes and on our streets. With Worthing’s town centre suffering, like so many others, with the closure of HMV, Jessops and Blockbusters, the County Councillor for the town centre area, James Doyle, is calling for joint action on an immediate plan to support the retail heart of the town. 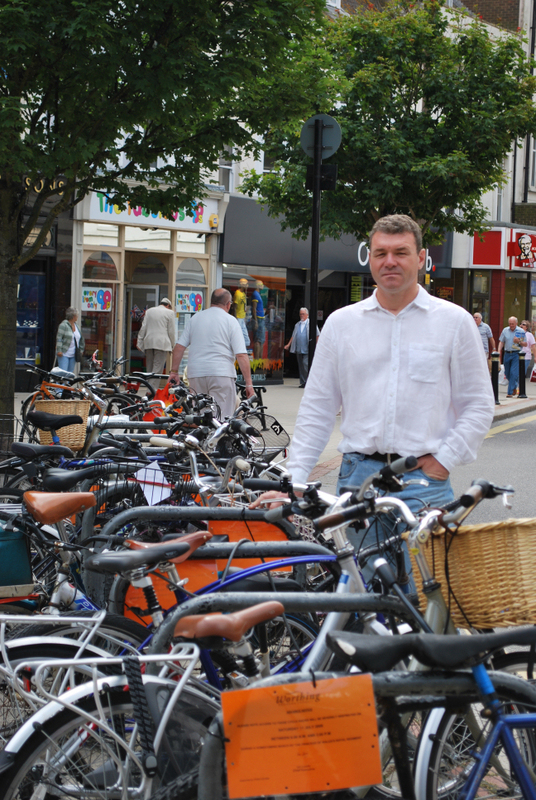 James Doyle in Worthing Town Centre: bringing bikes to the heart of the town helps people shop cheaper, quicker and greener. Enhance the street environment: improve the paving in Montague Street, make the crossing of Crescent Road into the ‘West End’ more pedestrian-friendly, and look at shared use in the West End. The County Council has already agreed to look at some of these points, and consultation on the Crescent Road crossing should take place soon, I hope this will be only the first step in an ongoing programme of improvements. Set up a virtual High Street for Worthing: the Borough Council and TCI need to develop a website and smartphone app to bring all of Worthing’s shops together, developing a stronger appeal for shoppers and allowing cross-promotion of offers and discounts which would be usable on a customer’s next actual shopping trip into Worthing. Who knows, we could even promote discounts on the car parks! Support Independent Traders: concentrate the work of organisations that offer business training, advice and support around the independent traders who make our town centre unique; Worthing is at the mercy of chains, but we can encourage those traders, like Type 40 Toys in Montague Street, who bring in visitors from far and wide. Act on Empty Shops: one fifth of Worthing’s empty shops have been empty for over two years; and rents have not been lowered in that time. The Borough Council and TCI need to call commercial landlords to account for their passive sabotage of Worthing’s economy, and ask why they are unwilling to drop rents to get shops open again. The council should name and shame those landlords who are not doing enough. One of the UK’s leading experts on empty shops, Dan Thompson, lives in Worthing and is a passionate advocate for the local economy; why is the Borough Council not using his expertise and advice? I am a county councillor here in West Sussex, and a former mayor of Worthing. When I first heard of the NeverSeconds blog, I was delighted to see a school child actively engaging with the process of education and politics – I’m sure that, like me, you often tell people that everything around us is politics – I’ve even used school meals as an example in the past! I was appalled to see today that your council have taken the decision to ban Martha from taking photos of school meals. Firstly, you have taken a huge step to discourage Martha, and children like her not just in Argyll & Bute, but all over the country, from engaging in political discussion – you have made them feel worthless. Secondly, you have taken a hugely illiberal and authoritarian stance, acting in an overbearing and patronising way towards a nine year old girl. Thirdly, you have shown, or at least given the impression, that you are afraid of the results of her blog and project. You are dealing with the messenger not the message: if the school meals are, in your view, satisfactory, what have you to be worried about? And if they are not ok, why are you not taking action to make sure your schoolchildren get decent nutrition at school, and instead trying to attack and gag someone who was commenting about the problem? Please remove the ban on Martha Payne’s blog, and let’s hear from you immediately about what you are going to do about the real problem. A joint control room is to be set up for West Sussex and East Sussex Fire & Rescue Service. The control room will be sited in Haywards Heath. The council leaders for Worthing (Cllr Paul Yallop) and Adur (Cllr Neil Parkin) will be jointly interviewed by the scrutiny committee members on their priorities for the coming year. The vision and priorities for the councils are included as an appendix to the report for this item. The vision consists of four bullet points, of which numbers 1 and 3 are process-oriented and about the internal working of the council(s), number 2 is again process-oriented, but with external partners, and number 4 is so vague and nebulous as to be meaningless – it’s worth quoting in full, really: ‘Developing a culture of innovation and entrepreneurship’ – how do you measure achievement of that? Not a single goal for something that will improve the town or the life of its people. Similarly for the priorities: there are twenty-seven points, virtually of all of which are about maintaining the current levels and standards, keeping costs low, or supporting worthy but nebulous activities with external partners. It shows a real poverty of vision and ambition when your top environmental priority is to keep collecting rubbish and recycling (no mention of improving recycling rates); your top economic aim is to support regeneration , but doesn’t mention any specific sites or projects (I’m sure every resident could name one or two), and your housing target is no more definite than to ‘seek to meet the housing needs of our communities’. 1. There is due to be an update on the councils’ ‘involvement with’ Fuel Poverty (possibly could have chosen a better phrase, there) in July; an article in today’s Independent (http://ind.pn/KpQGwj) highlights a new report saying that,while DECC estimates 3.9 million people live in fuel poverty, the figure could already be nearly six times at high at 23 million, and could reach 30 million by the end of 2012. I hope someone raises this at the meeting. 2. The work programme refers to a twice-annual report on the work of the Local Strategic Partnership, with the last one reviewed in December 2011, and the next one due in June 2012. Perusing the agenda shows that there is no such report for review. Sadly, this is a confidential item, so no report is available in advance. I hope the committee members will fully scrutinise the reasons why this is being taken in confidential session. There is only one application on the agenda – a request to cut down a protected horse chestnut tree at St Mary’s RC School in Central ward. The recommendation is to refuse, which seems sensible to me. On a general note, a light agenda like this for the Planning Committee is not uncommon these days; partly this is due to the recession, but also the Committee has delegated the bulk of the planning decisions to officers. While no one wants to see a return to the days of 8-10 hour Planning Committee meetings, perhaps this sparse agenda indicates that the pendulum ought to swing back a little. Only one ‘red’ traffic light, which relates to establishing a protocol for leader/chief executive relations, but this is one of several items which are described as delayed or not progressing – although some of the latter are still ‘green’! Really pleased to see the panel recommend that special allowances should be removed from policy advisers. On a small council like Worthing, there are far too many of these makeweight posts with no defined accountability or remit; if the cabinet members want advice they should ask the scrutiny committee (or committees, it’s a pet peeve of mine that Worthing only has one). Also, it makes sense to reduce the allowance for the Licensing Committee Chairman, it used to be a heavy workload, and now isn’t. I was slightly worried when I saw this item that the council was considering getting rid of the recourse to petitions offered to residents, but thankfully it’s just a procedural item regarding a contract for software. There is a good result to this: the recommendation is to allow e-petitions to be submitted via any online petition software, which means that the petitioner(s), not the council, will have control of the process. No word from WBC on why the Allotments Policy was not a key decision, but it was a short week last week with the bank holidays, so maybe I’ll hear something this week. Application for Voluntary Redundancy: report issued 17/5/12, decision due after 25/5/12.